Take a Virgin train along the west coast from London to Manchester, and you might be surprised to find a can of honest-to-goodness craft beer, Wreckless or Tilting Ale. And, as you’re sitting back in your seat to enjoy your first sip of this marvel, you may (perhaps unknowingly) pass within a few meters of the brewery where it was made: RedWillow. I arrive in the north-west town of Macclesfield, just south of Manchester, on a beautiful spring morning, to find the RedWillow brew team hard at work on the batch of Perceptionless New England IPA that will eventually find its way to Beer52 members, Perceptionless being Beer52 and Ferment Magazine’s favourite beer of Craft Beer Rising back in February. My welcome party consists of marketing and events manager Nadia and the brewery’s Labrador puppy, Poppy. Coffee in hand, I get a whistlestop tour of RedWillow and its recent history. Founded in 2010 by Toby McKenzie and his wife Caroline, RedWillow evolved out of Toby’s garage homebrew project, which had grown (in his own words) “a bit out of hand”. An IT director and trained biochemist, it’s easy to see what appealed to Toby about brewing. He runs a tight ship, and RedWillow has earned a reputation for the consistently high quality of its beers and its professionalism as a supplier. At the same time though, he’s clearly a creative individual with a lot of passions, and our conversation covers everything from economics to pulp science fiction novels. Situated right on the West Coast Mainline, the brewery occupies a former station building, whose stone walls can still be seen inside the modern brewhouse. It’s only been in this building for around 18 months, having moved from a much smaller premises further up the hill, which is now their warehouse. The move was the first phase of a significant expansion in RedWillow’s capacity, and included the installation of a customised canning line. The expansion has also meant building on the commitment to consistency and quality that was proven so successful for RedWillow. Its lab is among the best-equipped I’ve seen in a brewery of this size – everything is monitored, tested and meticulously recorded, making mistakes both far less likely and easier to pick up if they do occur. “We spend so much time developing each beer that, when we finally pin down the process, we want it to be exactly the same every time we brew, so we’re always sharing our beer in its best possible form,” says Toby. Phase two will soon see the installation of a larger brewkit and additional fermentation vessels – the current kit seems dinky, given the height of the room, and takes up barely a third of the available floorspace – and, from the sounds of it, can’t come soon enough for Toby and his team of brewers. “We’ve got some great customers, including Virgin Trains, Marks & Spencer, Booths and The Co-op, so that means a good chunk of our production is already accounted for,” says Toby. 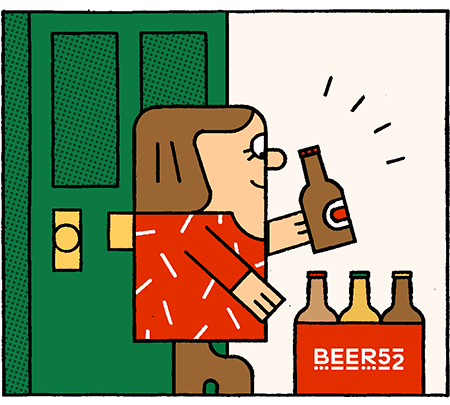 “Then we get an order like Beer52’s and I’m looking round the warehouse for beer that hasn’t already been sold! Working flat-out to meet demand is a common growing pain among successful breweries, and one that can often lead to focus being pulled away from recipe creation and innovation. Toby however has surrounded himself with a great team, giving himself space to experiment with the brewery’s small pilot kit, which today is fermenting a batch of fruit gose which will be part of their yeast-centric Clueless range, which will be exclusive to their brewery tap. It’s clear that sharing his passion for flavour exploration is still a huge part of what drives Toby (and, indeed, the entire RedWillow team) both in the core range and in its seasonal and experimental brews, otherwise known as their Faithless range, now into its 70th brew. “I love beer that makes me smile, that gives me that warm feeling, you know? That’s the only reason to make beer. One of the advantages of the move is that it’s freed me up to spend more time developing new styles for our core range. We just want the pales, the stouts, the session IPAs we brew to be the absolute best they possibly can be, so that they have a valid reason to exist. For example, with Weightless, our Session IPA, we released a series of single-hopped Session IPAs until we got to an end result; a beer we feel is an excellent representation of that style,” he says. I love beer that makes me smile... That’s the only reason to make beer. Similarly with Perceptionless, there were many iterations of that beer brewed on the small kit. I speak to most of the RedWillow team over the course of the day, and every one of them says something similar; they are clearly passionate about all aspects of flavour, whether in beer, wine or food. Steph, who creates the menus for the bar, and much of the food using local ingredients and suppliers, for RedWillow’s taproom, accosts me as I’m grabbing another coffee, keen to share a prototype pickled egg created using the chipotle sauce from a pizza ingredient she recently introduced at the bar. As well as being delicious, the development of the egg is actually a great example of how ideas evolve and feed into one another at RedWillow. The chipotles used in Smokeless, its smoked chipotle porter which has been in the core range since 2010, are also used to to create a pizza topping sauce which inspired the development of the egg using the sauce. Toby. “For us, it can be cask, keg, food, wine, gin. I just want to know does it excite me when I taste it? Does it make me want to know how they did that? Does it make me think ‘actually, if you paired this with this, that would be amazing’. That’s fundamentally what we try and do. While we’re talking about format, I’m keen to hear Toby’s thoughts on the perennial cask vs keg debate. Like many, particularly in this part of the world, RedWillow started out 100% cask. Just a few weeks ago though, it hit the tipping point where its canned beers surpassed cask and keg in volume for the first time, and the brewery’s yard is stacked full of kegs. But is this a predictable evolution, as RedWillow’s growth brings a shift in its distribution channels, or does it indicate a broader change in tastes? “A well-kept cask beer is great, particularly for certain styles,” Toby says. “I personally go for dark beers in cask; a low-ABV dark on cask can be superb, and on keg that’s could be a bit thin but that doesn’t mean you can’t design great dark beer for keg. RedWillow’s own taproom, round the corner from the modern train station, has also become a hugely important part of the business, not only in terms of revenue but – more importantly – cementing RedWillow’s place in the community and engaging with drinkers. Nadia, who moved from the bar to the brewery last summer, says: “The brewers and Toby will often be at the bar after work and we have developed a good relationship with customers. People aren’t afraid to tell us if they don’t think a beer is up to its usual standard, or if they really like a special. Time and again, Toby returns to the subject of his 12-strong team, most of whom are in the rabbit warren of the old station house. As well as Caroline, Nadia, Steph and Sophie, a number of the admin team came to RedWillow via the McKenzies’ kids’ school, including financial controller Amanda, and Carolyne who assists with sales (“The only downside is I go to pick up my kids from school and it turns into a staff meeting,” quips Toby). The arrangement not only gives RedWillow access to a pool of talent and experience, but also provides working parents with the kind of work/life balance Toby sought when he founded the brewery. On the brewhouse floor, long-serving brewer and friend Ian has recently migrated north to Brewdog, but Toby, Graham, Rich, Mel, Pete and Paul are clearly an expert and well-practised team handling brewing, production, distribution, and warehousing. Above all, there’s a great sense of locality about the team at RedWillow. They live and work in Macclesfield and are genuinely invested in the network of mutually supportive local businesses, from the farmers who provide meat produce for the kitchen, the craftsmen who maintain the brewery equipment and local graphic designer Visual Sense who created the can design. They clearly also enjoy a great relationship with the many nearby breweries throughout Cheshire and Manchester, who make regular appearances on the RedWillow taproom’s 15 keg and seven cask lines. However, Toby also expresses some concern that such collaboration – which he sees as one of the most positive and exciting aspects of UK brewing – may be under threat as the culture subtly changes. While I’m inclined to agree, I sincerely hope my fellow beer-lovers will be able to see through the big- budget marketing drives, because it’s breweries like RedWillow that make the UK craft beer scene such a great place. Whether they’re brewing the beers or keeping the books, my lasting impression is that every single person there goes into work with the same simple goal: to share the things that make them happy. A noble calling if ever there was one.